The rapidly growing population of adults surviving with congenital heart lesions along with the success of interventional cardiology in the child and adolescent has spawned an incredible interest in adapting the technology for the adult congenital patients. Dr. Mullins, a pioneer in this area, has written an outstanding reference which covers all aspects of performing diagnostic and therapeutic cardiac catheterization procedures on patients of all ages. This illustrated book details the equipment and techniques for performing safe and successful procedures, with a strong emphasis on avoiding complications. It also includes the requirements of a catheterization laboratory for congenital heart patients, as well as guidance for setting up and operating such a laboratory. Cardiac Catheterization in Congenital Heart Disease serves as an essential manual for pediatric and adult interventional cardiologists worldwide. 1 Organization of a pediatric/congenital cardiac catheterization laboratory. 2 Medications used in or in conjunction with the cardiac catheterization laboratory and patient preparation for cardiac catheterization. 4 Vascular access: needle, wire, sheath/dilator and catheter introduction. 6 Special guide and deflector wires and techniques for their use. 7 Flow directed catheters (“floating” balloon catheters). 8 Transseptal left heart catheterization. 9 Retrograde arterial cardiac catheterization. 10 Hemodynamics, data acquisition, and interpretation and presentation of data. 14 Blade/balloon atrial septostomy, special atrial septostomies, atrial “stent septostomy”. 16 Pulmonary valve balloon dilation. 17 Dilation of branch pulmonary artery stenosis. 18 Dilation of coarctation of the aortaanative and re/residual coarctation. 21 Dilation of tricuspid valve stenosis, systemic vein stenosis and miscellaneous intravascular/intracardiac stenoses. 22 Intravascular stents in congenital heart diseaseageneral considerations, equipment. 23 Intravascular stent implantapulmonary branch stenosis. 24 Intravascular stents in venous stenosis. 25 Coarctation of the aorta and miscellaneous arterial stents. 26 Occlusion of abnormal small vessels, persistent shunts, vascular fistulae including perivalvular leaks. 27 Transcatheter occlusion of the patent ductus arteriosus (PDA). 28 Transcatheter atrial septal defect (ASD) occlusion. 29 Occlusion of the patent foramen ovale (PFO), atrial baffle fenestrations and miscellaneous intracavitary communications. 30 Transcatheter closure of ventricular septal defects. 31 Purposeful perforation of atretic valves, other intravascular structures and recanalization of totally obstructed vessels. 32 Special innovative or new, therapeutic catheterization procedures and devices. 34 Phlebotomy, pericardial and pleural drainage. 35 Complications of diagnostic and therapeutic cardiac catheterizations. "The figures included in Cardiac Catheterization in Congenital Heart Disease reveal, in a simple yet powerful way, the basic strengths and characteristics of this long-awaited textbook from Charles Mullins. Line drawings demonstrating the intended course of needles, catheters, wires, and devices take the place of the fluoroscopic images and angiograms typically provided in catheterization textbooks. The idealization of these images is emblematic of the precision, deliberation, and attention to detail with which the author has approached catheterization of the child with congenital heart disease, an approach that has been successfully handed down to dozens of talented and dedicated trainees. 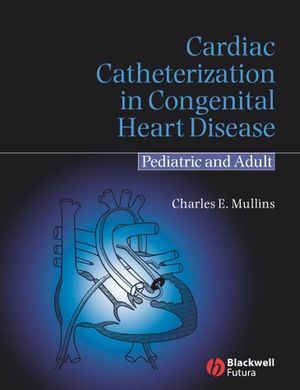 ...Cardiac Catheterization in Congenital Heart Disease succeeds as a highly useful, instructive, and valuable textbook, largely as the result of Dr Mullins’s very personal view of his subject matter. In a field created and dominated by only a handful of leaders who have, in one fashion or another, trained almost all of the practitioners around the world, the publication of the experience that Dr Mullins gained over 40 years in the catheterization laboratory presents a milestone in pediatric interventional catheterization. This book codifies Dr. Mullins’s approach and provides, in a highly organized and readable format, a great deal of information relevant to pediatric interventional practice that has been, until now, passed through piecemeal reviews, book chapters, and much smaller, more focused textbooks. "The 35 chapters dedicated to this small, highly specialized field with unique technical demands covers topics ranging from the optimal floor plan of a modern pediatric interventional catheterization laboratory, to the energy requirements for radiofrequency perforation of an atretic valve, to the precise method of handling guide wire positioning in the distal part of the circulation during balloon dilation and stent implantation. ...a comprehensive, detailed technical manual. The chapter on transcatheter atrial septal defect occlusion arms the interventional cardiologist with detailed knowledge of all the available occluding devices and the particular tricks for using each of these devices and delivery systems in a full 50 pages of text. Similar attention is paid to techniques and tools for obtaining vascular access and for performing balloon dilations. Although some of the very specific information provided will become obsolete rather quickly, points on the prioritization of balloon characteristics desirable for a particular intervention, or the general principles of wire placement and device handling will always remain relevant. As a technical manual, this text is extremely successful. ...this textbook will accomplish the author’s goal of providing useful information to readers practicing at any level within the subspecialty field of pediatric interventional cardiology. To trainees and those recently entering the practice who may have had extensive exposure to pediatric interventional techniques but limited hands-on experience, this text will serve to solidify many of the concepts and common techniques used in the pediatric interventional laboratory. Advanced operators will use it as a reference and a technical narrative of minute details to aid in the planning of particular cases or in the management of infrequently encountered situations. As such, it is an enormously useful and long-awaited addition to the field of pediatric cardiology." "...a readily accessible, comprehensive, encyclopedically detailed compilationthat is both a reference book, and a working manual all in one volume. The book contains the most comprehensive details of catheter procedures, extending from vascular access and catheter manipulation, to the definition of cardiac structures displayed by specific radiographic views, the choice of views for specific diagnostic purposes, interpretation of hemodynamic and imaging data, and potential complications of catheterization, both diagnostic and interventional. The greatest strength of this book is certainly its comprehensiveness and detail. The information presented documents the author’s 40 years of pioneering experience in this field – a field that he has championed and led. Some of the information is not available from other sources - it does not lend itself well to journal publications. Most often, such information is handed down by word of mouth from the accomplished invasive cardiologist to the trainee at the cardiac catheterization table. The book should be available to every cardiologist seeking to hone his skills in specific techniques, and particularly trainees who are inexperienced in these procedures. Obviously, reading the text should complement “hands-on” experience under the watchful eye of an experienced mentor – neither reading the text alone, nor performing procedures without the necessary knowledge, is acceptable. Reading should supplement the practice, and practice should consolidate the reading! This is, without doubt, the most valuable contribution this book can make. It is a vitally, fundamentally important contribution, regular reference to which will certainly enhance the safety and quality of cardiac catheterization procedures in patients with congenital heart disease. This is an excellent, comprehensive, well written resource, documenting a vast amount of practical information not available in any other single book. The material presented is based upon a lifetime of innovation, research, and practical experience of a master invasive cardiologist, and the information presented is authoritative, reliable, state-of-the-art and of inestimable value. It is a working manual that should be referred to constantly, repeatedly, and confidently. It is a book that is a niche resource, but that is its value. Indeed, in this regard, it is invaluable! It should be available to every invasive cardiologist faced with the complexity of congenital heart disease in children or adults. For this purpose, I recommend it with full confidence and enthusiasm." "Cardiac Catheterization in Congenital Heart Disease is an outstanding textbook based on the experience and practice of the author during four decades of work in the Catheterization Laboratory at the Baylor College of Medicine, Texas Children’s Hospital, and who has been an innovator and leader in the field of cardiac catheterization in congenital heart disease for those 40 years. Not only has Dr. Charles Mullins been one of the major innovators for all aspects of cardiac catheterization techniques, but he has also taught and trained hundreds of individuals who utilize his experience in techniques to do cardiac catheterizations around the world. There is no single individual who has influenced the cardiac catheterization field in congenital heart disease as much as Dr. Mullins. As Dr. Mullins says, this text emphasizes “the minute details and fundamentals of catheterization procedure”. His attention to the smallest detail in both practice and innovation is truly the reason he has been so successful over the years. Catheterization: (1) hemodynamics, dye curves, data recording and (2) angiographic techniques. Dr. Mullins then goes into specific interventional catheterization techniques, such as atrial septostomies, septectomy, balloon dilatation, mitral valvuloplasty, coarctation dilatation branch pulmonary artery and pulmonary artery stenosis dilatations, and intervascular stents. The last part of the textbook is focused on individual congenital heart lesions, such as patent ductus arteriosis, atrial septal defect, patent foramen ovale, ventricular septal defect, transplant endomyocardial biopsy, and the techniques utilized to address those particular defects with, again, outstanding illustrations and explanations of the manipulations involved. This text is a “must” in the library of anyone who deals with any aspect of congenital heart disease, whether that is pediatric or adult congenital heart disease, clinical care, congenital cardiac nursing, or congenital cardiac surgery. It is the accumulation of an individual’s experience, wisdom, and knowledge over 40 years as these techniques have evolved, and of an individual who has been at the forefront of the development and creative implementation of all areas of cardiac catheterization as it relates to congenital heart disease. It is a superb textbook and a tribute to the talent, experience, and wisdom of an individual and an institution that have made great contributions to congenital heart disease over the past 35 years." "Cardiac Catheterization in Congenital Heart Disease - Pediatric and Adult is an exceptional book!...It is without doubt the most authoritative, the most comprehensive and the most detailed textbook about cardiac catheterization in congenital heart disease ever published....Each chapter is well-referenced. Unlike most familiar texts of this magnitude, Dr. Mullins wrote every chapter and every word. This is all his work...Any cardiologist seeking education or information about venous stenting, need only study this one source...It is obvious that with this book, Dr. Mullins gives each of us a gift. In the Preface he tells us that 'the information contained in this text...represents the accumulation of knowledge, techniques, and procedures learned, utilized and/or developed by the author during the continued learning, practice and teaching, of cardiac catheterization procedures during...four decades in the field."